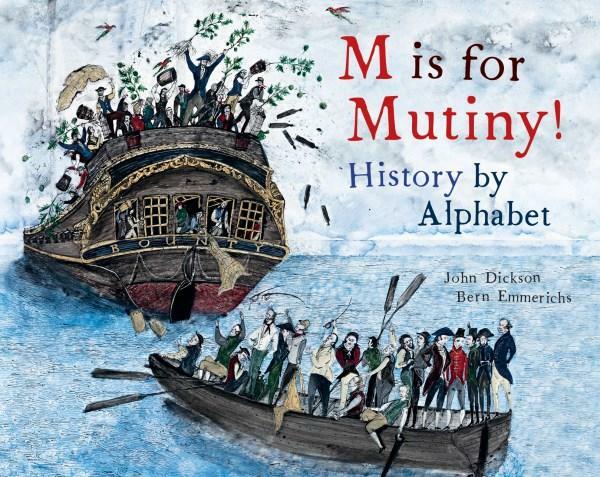 M is for Mutiny is a history by alphabet. Take the letters of the alphabet and link each of them to a person, event or something else of significance from Australian history. What would you include? M is for Mutiny acknowledges Australia's first peoples, starting right at the beginning with the letter A being for Acknowledgement of Country, and acknowledging the traditional owners of the land on which the book was written and illustrated. Each double page spread is dedicated to a different letter, and has a paragraph explaining the chosen history. The mutiny referred to in the book's title refers to the mutiny on the Bounty, while the letter Q is for Questionable Acts, those of European settlers against Aboriginal inhabitants. Themes covered in the book include crime and punishment, the role of women, flora and fauna, and asking just whose truth it is in the history we tell. Teachers notes are available for downloading. There are also trivia tidbits. Like the fact that NASA named a space shuttle after James Cook's ship the HMS Endeavour, and that Governor Lachlan Macquarie had the colony's first flush toilet installed in Government House at Parramatta. llustrations for M is for Mutiny are by Bern Emmerichs, an artist whose work features in galleries in Australia and around the world. The style is fitting for the subject matter. M is for Mutiny is an excellent tool for introducing history and for questioning the perspectives we think we know. A great book for personal or school-based exploration.